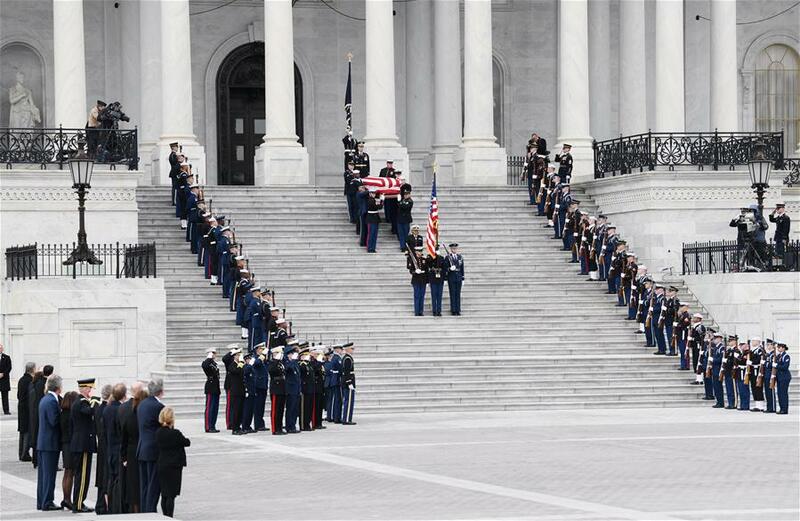 WASHINGTON, Dec. 5 (Xinhua) -- In laughter and tears, the United States held a state funeral here Wednesday for the 41st President George H.W. Bush, who has been widely mourned and praised as a good leader and a devoted person with a "gentle soul" and great sense of humor during his 94-year-long lifetime. President Donald Trump and first lady Melania Trump, four other living former U.S. presidents, together with dignitaries from across the country and foreign leaders attended the state funeral at the Washington National Cathedral. Bush was remembered as "America's last great soldier-statesman" by biographer Jon Meacham, one of four people that delivered eulogies at the solemn ceremony broadcast live on major U.S. TV networks. Meacham recalled Bush's public service and personal integrity, evoking laughter filling in the cathedral time after time. Delivering the final eulogy at the funeral emotionally, the 41st president's son, former President George W. Bush, said his late father was "a great and noble man. The best father a son or daughter could have." "He showed me what it means to be a president who serves with integrity, leads with courage and acts with love in his heart for the citizens of our country," said George W. Bush, who returned to his seat with tears in eyes. In and outside the Capitol Hill, along the Pennsylvania Avenue, thousands of Americans gathered on Wednesday morning to bid farewell to the former president when his casket was transported by a motorcade from the Capitol to the National Cathedral. Tom Wiggins was one of them. He told Xinhua that he admired the late president as a "good person and a good leader" who had an extraordinary and exemplary life. "Very bright, even-tempered, trying to be fair and considerate - a true gentlemen," said Ed Nef, 85, president of a nonprofit organization, The Ed Nef Foundation, who recalled his exchanges of light-hearted letters with the late president in 1991. They attended the same high school-- Phillips Academy, Andover -- in the eastern U.S. state of Massachusetts. Les Schroeppel, a resident of Washington D.C., told Xinhua outside the National Cathedral that he knew the late president served as head of the U.S. Liaison Office in China when the two nations were not diplomatically tied. He said the 41st president was effective in building contacts and communications with China and other countries. George H.W. Bush passed away on Friday at his home in Houston, Texas. The former president, who served as head of the U.S. Liaison Office in China between 1974 and 1975, was seen "an old friend of the Chinese people," who had witnessed and promoted the historic development of U.S.-China relations in the past decades. Born in 1924, Bush joined the U.S. Navy upon finishing high school in 1942. His wartime duty was spent in the Pacific flying a three-man Avenger torpedo bomber. He graduated from Yale University in 1948 with a degree in economics. Bush was elected U.S. president in 1988 as the successor to Ronald Reagan. Following the funeral service in Washington, Bush's remains will be flown back to Houston later on Wednesday to lie in repose at St. Martin's Episcopal Church before burial Thursday at his family plot behind the George H.W. Bush Presidential Library and Museum at Texas A&M University. He will be buried alongside his wife Barbara Bush who died seven months ago, and Robin Bush, the daughter the couple lost to leukemia in 1953 at age of three.